They say don’t judge an email by its subject line, but let’s be honest: We’re always keeping an eye out for the best of the best. After all, the subject line is one of the first impressions your message has on its recipients and can help you improve your opens and clicks. That’s a lot of pressure for a seemingly short line of text. While there is no secret to the perfect subject line, there are a few words and phrases that we turn to time and time again to get more eyes on our emails. Getting people to take action from your email can be difficult. There’s a lot that goes into getting more opens and clicks. Urgency is one of those things that can have a big impact on whether or not your email gets read. 3. Tick, tock! 30% off sale ends soon! 4. Going once, going twice! 5. Members get first dibs. 6. We couldn’t wait ‘til Friday! 7. When it’s gone, it’s gone. When it comes down to getting your emails opened, experiential verbs (like “celebrate” and “love”) perform better than functional verbs (like “spend” and “grab”). That’s not to say these words won’t work – it’s really all about context. 12. Act now for friends and family savings! 15. send some. get some. 18. Join me for a marg, Olivia? Being redundant pays off, especially when it comes to your subject line. That’s because it keeps you, the sender, top-of-mind. And being top-of-mind helps build trust, which can lead to more sales. It’s a win-win! 25. Did somebody say new Glossier? Just kidding, we totally do. And that’s because adding key superlatives to your subject line can help strengthen your core message and make it more effective. 29. Here’s a special treat, just for you! A question is a great way to spark some curiosity around your email, but it’s the type of question that matters. Yes or no questions perform better than open-ended questions. And don’t forget about sentiment: Questions with a negative association (like don’t or can’t) are the worst-performers. 35. What do you think? 36. Do you like prizes? 38. How could you top this? 39. Today’s the day! Are you in? 41. Details, please! Did you like your purchase? Punctuation can completely change the tone of your subject line with one simple character. And that can impact how your subscribers respond to your message. Even the lack of punctuation can change the gist of your subject, keeping things casual. Capitalization also has the same effect. Take notes. We’re big proponents of trying out tricks and tactics to see what works best. While you can’t predict results by looking at how past subject lines performed, you can use them as a basis for future iteration. Try adding some of these words and phrases in your next few subject lines and watch your open rates skyrocket. 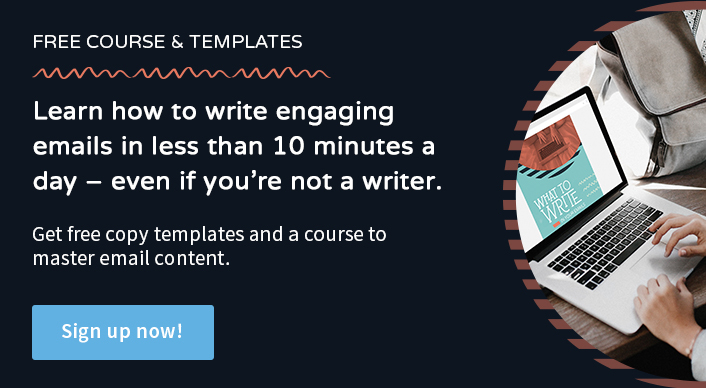 Now that you’ve seen 51 open-worthy subject lines, learn how to write betters emails with our free course and guide! İt is really cool .. thanks for sharing..
Good work. Your examples will make a useful swipe file (always helpful).